Thank you for your interest in supporting OAOR! There are many ways to get involved if you are interested in contributing to the well-being and support of OAOR and the monastics. Over 2,500 years ago, the Buddha established a relationship between monastics and lay people that was symbiotic and mutually dependent. 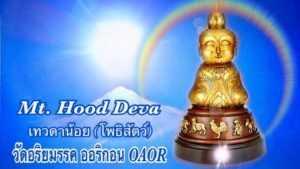 Since that time, support for Theravadan monastic life has been provided by lay supporters through daily acts of generosity. In the spirit of mutual benefit, the health of OAOR requires a group effort. Whether by offering services, pitching in for yard work or cleaning, material and meal offerings, or joining in the practice of Dhamma, the generosity of participation ensures the continuation and availability of Buddhist teachings through personal contact with the monks. OAOR now has a permanent residence in Sandy, Oregon. There are many projects to be completed as well as care and maintenance which require ongoing yard work or gardening, cleaning, building projects, and repairs. Your generosity helps the spiritual community to survive and flourish. If you are interested in helping, please contact us, check the Events Calendar, and/or sign up for our mailing list to stay up to date. Anumodana! May your practice of generosity be for the benefit of all!